Kelli Nina Perkins: Let the Drum Rolls Roll! Let the Drum Rolls Roll! With glee, I accepted this package from the postman. Lovely Rebecca from Interweave wrapped it in butterflies and sent it to me overnight. This was probably one of the hardest things I've ever done, and it's a joy to see the final product sitting here on my studio table. Now I get to read the dedications to all the people I love and let them know just how much their support has meant to me. May all of your dreams come true, as mine have! To celebrate this occasion, I'm going to have some giveaways...I have some artwork, some supplies and some extra copies of my favorite magazine Cloth Paper Scissors that I'd like to move out into the creative community. Check back soon. congratulations Kelli! I can't wait to get a copy of it! Kelli, I have been following your sight for over a year and so seeing that your book is now real, I am so happy for you. Awww - your mother is so proud:) I love what she wrote. Will you be at Long Beach? I will and hope to see you there. I am happy for you, what a wonderful thing to have created. I look forward to getting my own copy. I just got email from cloth paper scissors about your book - it looks great. congratulations ! Congratulations! I look forward to getting my copy! Have a fantastic weekend! I love your work and have pre-ordered your book - can't wait for it to arrive! The fabrics you designed and had printed are fabulous, such great colours. Congratulations. Can't wait to get a copy! I love your work. Lots of inspirations for us all. Your book is wonderful! I read it all in just two days and I want to try everything. Your instructions are nice and clear and as always your examples of the projects are juicy and cheerful. I've been playing with paper cloth for the last 6 months or so but your book really expanded my concept of what I could do with it. Your artwork has a fearlessness to it that really inspires me. 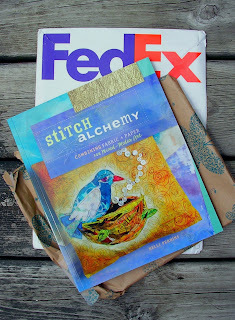 Just wanted you to know that this is the book review that I gave you at Fiber Art Traders, http://groups.yahoo.com/group/FiberArtTraders. I LOVE your book! letting me use two coupons but he knows me and just smiled. :-) Bless his soul. fabric and paper is deceiving as it much, much more than that. Wonderful book title and I love the cover!! Sounds like something I'd definitely be interested in...I will stop by the book store to have a look at it!! Congrats!